When analysing the responses to the Kano study - you might spot significant differences in a customer reaction to a particular topic. It might be an indication that you have uncovered a new persona. Every product has different user and customer personas. In user-centered design and marketing, personas are fictional characters created to represent the different user types. Personas are multidimensional. The following persona types could apply to almost any product: early adopter, early majority, late majority, laggards. Those archetypes might have significantly different emotional reactions to certain features of your product. Moreover, when features change type - that could be spotted with a persona. Kano study could give you such insights. 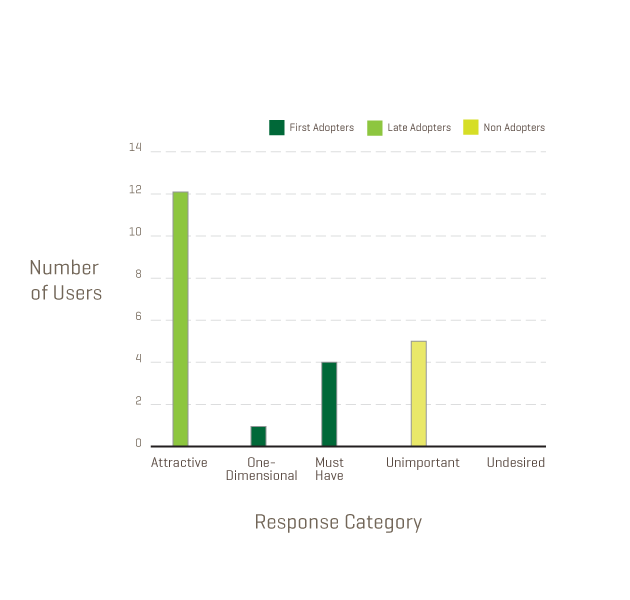 How to analyse Kano study results to find out what features are the most preferable for customers? One way is to add a feature importance question to a pair of functional\dysfunctional questions. 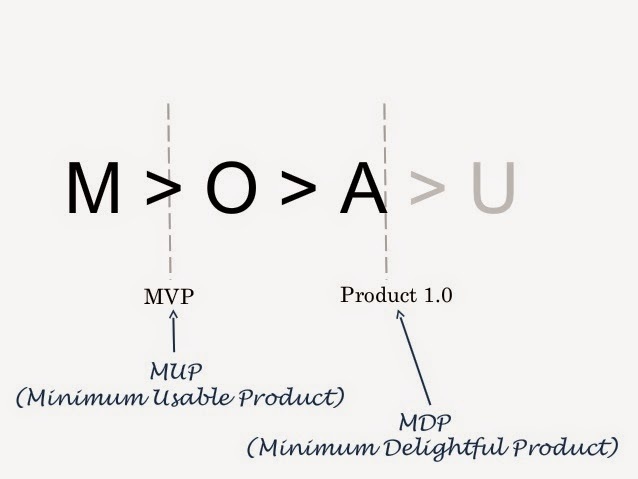 For every feature, you ask customer one additional question: "how important this feature is?" An answer should be provided on a scale from 1 to 9, from "Not at all important" to "Extremely important". Another way is to do a statistical analysis of Kano study results. Standard deviation will help you spot the significance of results. This method has been described by Bill DuMouchel. Jan Moorman in her excellent UXmag article suggests another, visual way to present Kano study results. It lists product features and satisfaction\dissatisfaction scales against them. Features sorted by the most potentially dissatisfying, if not included, on top. By looking at such picture you immediately see what features you should focus on. This is a useful way to present Kano study results to the dev team and other parts of a business. 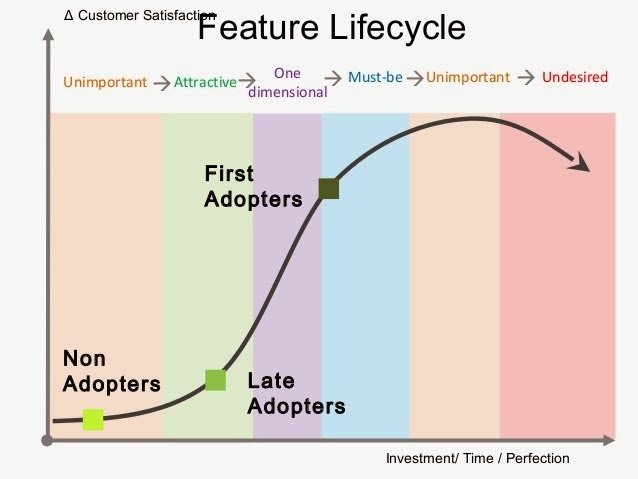 Customers are not expecting attractive features, therefore those are hard to uncover by just asking the Kano questions. What can you do to discover these? The best way is to do qualitative research: observation, interviews, focus groups. You need to understand how your customers are solving their problems and then be creative to figure out how your solution might help them to be more effective\satisfied. Kano model clearly shows that your product will not be hugely successful if you'll focus only on the optimisation of existing features. 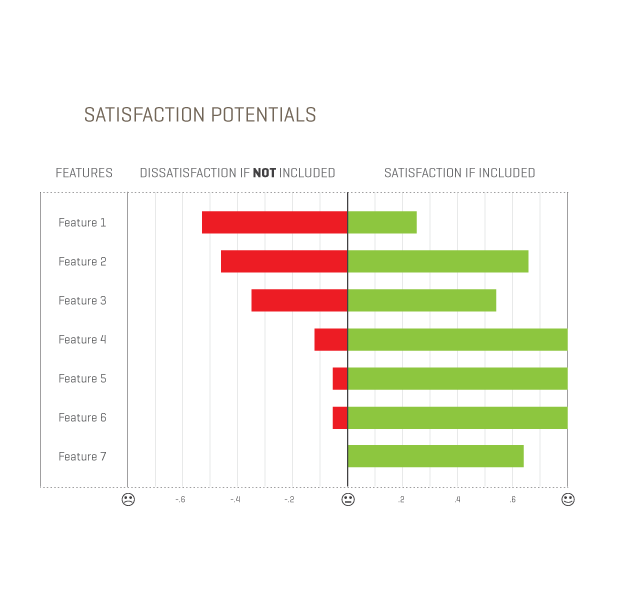 Improving "must-have" features might reduce customer dissatisfaction, but it will not help you leap forward. Without attractive features, without delighters, your product will be "just another one". How many customers should you ask? The answer is pretty simple (in theory): you need as many people to get statistical confidence. For some studies 6 respondents are enough, for some it could be 12, 24, 48, 64...etc. The following basic rules apply: you need a representable group of participants. To spot the more significant differences, you need fewer participants. While more granular results require more respondents. Tip: When defining your participants' list check how chosen people correspond to your personas.